I love walking down the north side of Grand Street between Mulberry and Mott, the only block of Manhattan's Little Italy that seems to retain some authenticity and practical application, vis a vis good food. 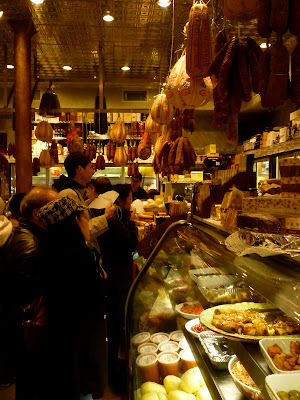 Alleva Dairy, Piemonte's Ravioli, Di Palo Fine Foods—I love these old shops. Alleva and Di Palo's (below) are both touted for their mozzarella. I've bought cheese from both places on occasion, but never at the same time, and never really sat down and chose a favorite. So, last Saturday I stopped by both Alleva and Di Palo's and bought a lump of fresh house-made mozzarella from both stores. (With a side trip to purchase some broccoli rabe ravioli from Piemonte.) It took a minute at tiny Alleva. It took about a half hour at large, crowded, take-a-ticket Di Palo's. Both cheeses were made fresh that day; I asked. Ho Ho Florist is an old school Chinatown business on the corner of Hester and Elizabeth. 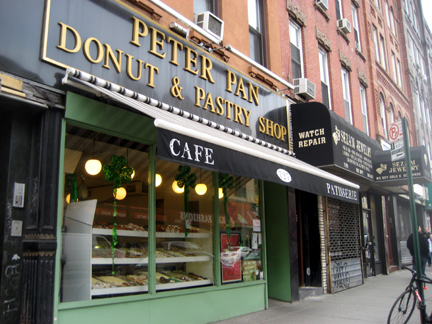 By the looks of the business—note the green-painted wooden cornice—things haven't changed here in decades. Saw this grand old movie theatre on a recent drive through Riverhead, on the North Fork of Long Island. 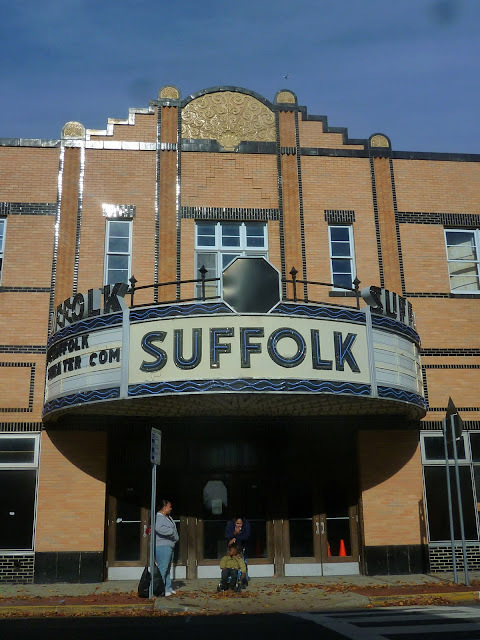 The Suffolk Theatre was built by R. Thomas Short and opened on December 30, 1933 and closed in 1987. For a time, it was threatened with destruction. But in 1994, the town of Riverhead has spent about $1 million to purchase the Art Deco theatre and in 2001 restored its roof, marquee, and front facade. It still looks in good shape, but it's not in use. The long delayed restoration of the theatre inside apparently began in August 2010. It will be a performing arts stage and a movie theatre. It has one of the most splendid marquees I've ever seen. Last summer, a friend of mine suggested, as a way to stave off depression while writing this blog, that I rename is "Found City" and write instead about great new things in New York, rather than the great old things New York was losing. Well, I'm not changing the name of the blog, or it's mission. But he had a point. Not everything old was good. And not everything new is bad. I never insisted on any notion of the kind, though many have assumed my thoughts went along those lines. So, here's the Soup Bowl. Something new and good. It's a pop-up store, temporary taking the place of Uncle Louie G's ice cream. It opened this month and will only be around until Louie G's returns in the spring. But I hope they stick around longer. It's a good place, and the owner, Richard Gussoff, is terribly friendly and earnest. He told me he gets up early every morning to go to the City's various greenmarkets to get the ingredients for his soups. Selections change every day, and can include such interesting things as Squash Lobster Bisque and Baby Carrot Asparagus. Prices are much more reasonable than chains like Hale and Hearty. 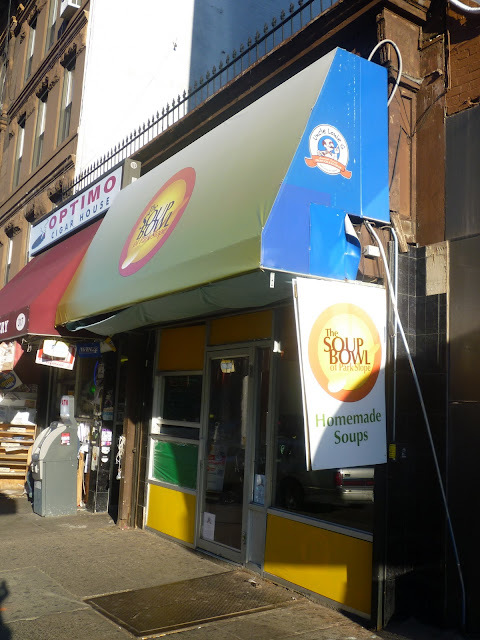 Soup Bowl is at 321 Seventh Avenue, near the F train stop. I don't look for authenticity in Times Square much anymore. Maybe that's why I've never gone inside Ray's Beauty Supply on Eighth Avenue, despite it's enticing claim to be "The King of Beauty." My mistake. Turns out it's not a run-of-the-mill drug store, but equipped with one of the most eccentrically complete stocks of beauty and bathrooms supplies in town—more than 10,000 different items—most at good prices. They have your regular shampoos, creams, combs, curling irons and hair dryers, but also the fancy schmancy, serious stuff you see at hair salons. They seem to be fairly renowned for their hairdryer selection, and also do a fair trade in wigs. They even repair hairdryers, which is odd in this day and age. Saw this tiny, cement store in Riverhead, Long Island, and like it in so many ways. The Souvlaki House has been on Lawrence Street, just off grubby old Fulton Mall, for 40 years. This probably makes it one of the few old restaurants in the area. 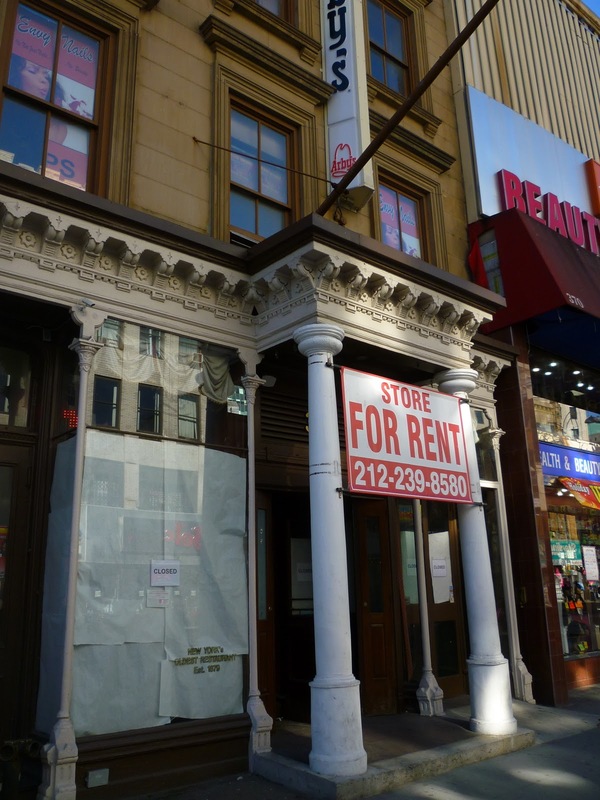 Eateries don't last long in Darwinian downtown Brooklyn. 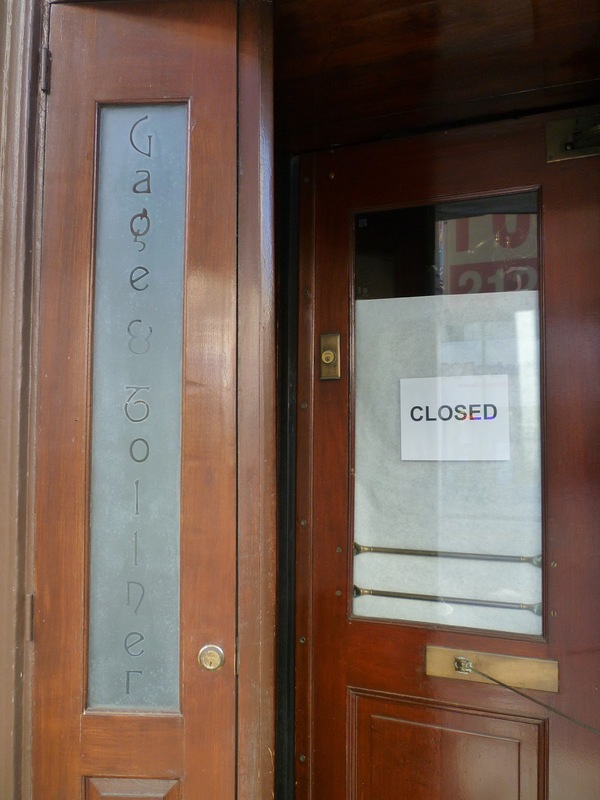 The only exception for many years was Gage & Tollner. And that finally bit the dust, as we all bitterly know. Souvlaki House is hardly in the same league as Gage & Tollner. But it does what it does with a certain bygone charm. It's run by a father and son who are always behind the counter. The father, white-haired, mans the spinning cylinder of gyro meat, tenderly carving off slices into his special, dustpan-like utensil as they are ordered. Court Street Landmark No Longer "Discount"
At some point recently, the indispensable Cobble Hill notions and sundries store Winn Discount changed its name, and its sign, to Winn Home & Beauty. 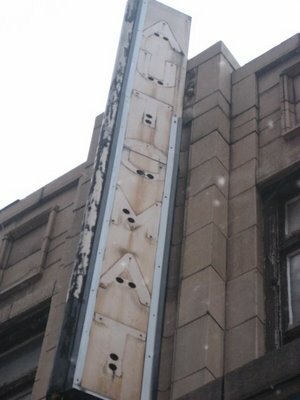 Thankfully, they have retained the general design spirit of the old sign, even if the "Winn" is a bit more fancy and curvy now. Otherwise, the change is, I feel, unfortunate. "Winn Discount" was easy to say. The name had a lovely assonance to it. It fell trippingly off the tongue, as in "I'm going to the Winn Discount." No one's going to say, "I'm going to the Winn Home and Beauty." 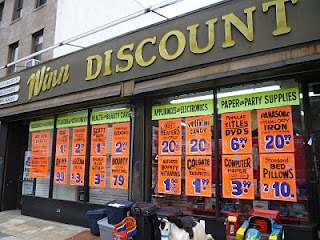 I suspect the neighborhood will continue to call it Winn Discount. Once of the bright spots in the bleakness that is downtown Brooklyn was the leftover Automat sign that could be spied by the watchful on Willoughby Street. The lovely artifact has now been covered up by Conway, which took over the space a while ago. As things were: see below. 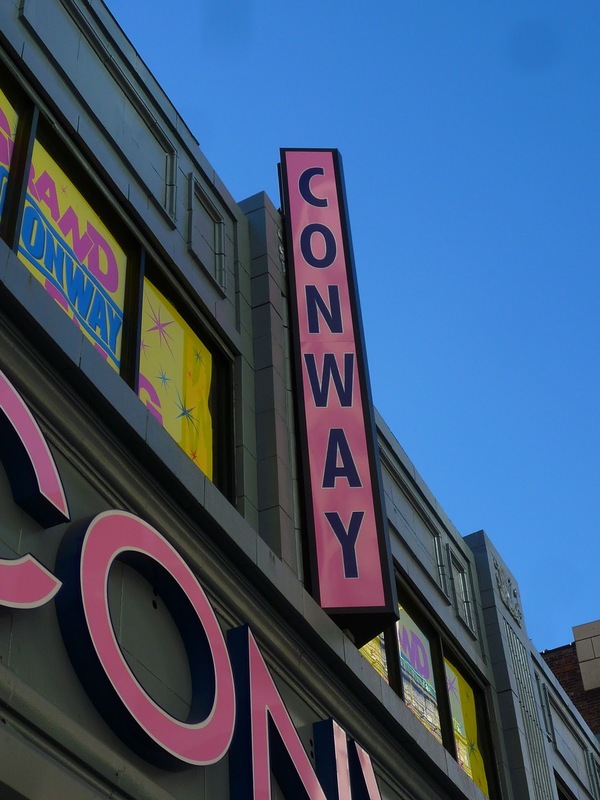 It's comforting to know that the ghostly letters are still lying there under the ghastly Conway pink. Lost City Asks "Who Goes to Sam's?" Been to Sam's a number of times over the years. Finally wrote it up for "Who Goes There?" Nice shot of the pizza oven. I've never been inside the kitchen. To eat at Sam's is to know Louis Migliaccio. 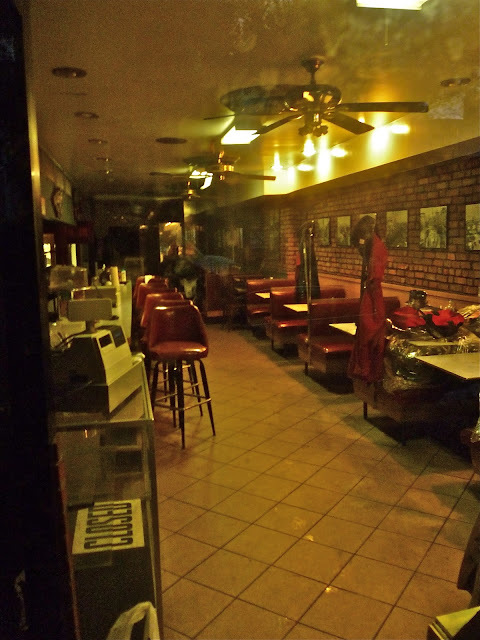 Louis is the waiter, bartender, sometime cook and chief bottle washer at this Court Street institution, and the son of Mario Migliaccio, who has made pizzas at this timeless, basement-level, red-and-white-checked-tablecloth joint for sixty years, and is or is not retired now, depending on what article you read. Labels: sams restaurant, who goes there? The Arby's the worked very hard with the Landmarks Commission to get into the landmarked interior of the old Gage & Tollner space has closed. This is old news. It happened last August. I'm just putting it down here for the record. Maybe the coming of Danny Meyer's Shake Shack will help attract a restaurant with some dignity and some staying power to the space. Snake a big silvery steam pipe up the side is one way. 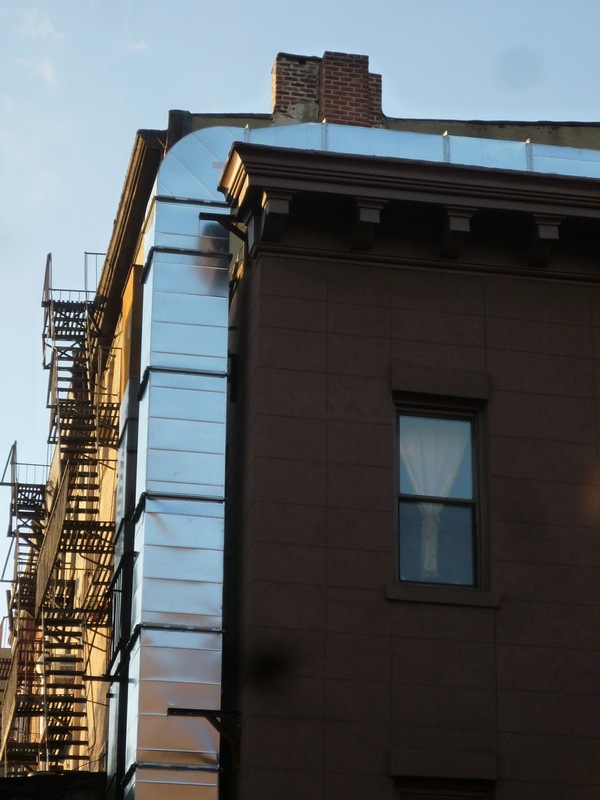 This is a building on Court Street in Carroll Gardens that that the AIA Guide to NYC went out of its way to praise as "a brownstone bracketed Italianate corner villa." It dates from 1860. The steampipe, meanwhile, is timeless crap. Apparently, the vital new business going into the ground floor needs it. Got this note from a reader about Brooks 1890 Restaurant, which has been closed for renovations for a month: "Passed by the restaurant the other day and there are new red awnings replacing the green ones that had been up for quite awhile. Also, a note on the door stated that they are re-opening. So, looks like the restaurant is still in business." Good news. But still many question unanswered. Will the menu change? Has the interior been altered? What of the stained glass? New owner? UPDATE: The same fine citizen sent me the photo above. 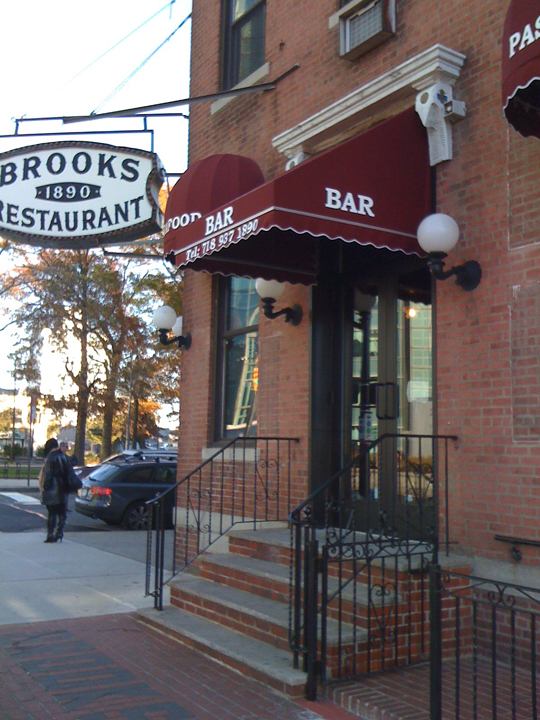 So that's what Brooks looks like now. Also: It reopened Friday, Nov. 12. My neighborhood, west of Carroll Gardens around Columbia Street, used to be bustling enough to support two cinemas, the Luna and the Happy Hour. The Happy Hour is long gone, but the shell of the Luna has lingered on the east side of Columbia, neat Degraw. It was boarded up for the longest time, with the vague promise of some construction in the future. Well, that construction is finally happening, and it mainly involves the dismantling of the brick walls within with many Italian-Americans watch black and white flicks. The theater opened in 1914 as Auditore Maurice Theatre, and became Luna in 1920s. It closed in 1952. It's capacity was 559. If I'm reading building records correctly, it's going to be a new four-story apartment building with a penthouse and eight units. I've known for some time that actor Eli Wallach was born at 164 Union Street, in Carroll Gardens, near Hicks. But a recent New York Times profile on Wallach revealed a further bit of information. 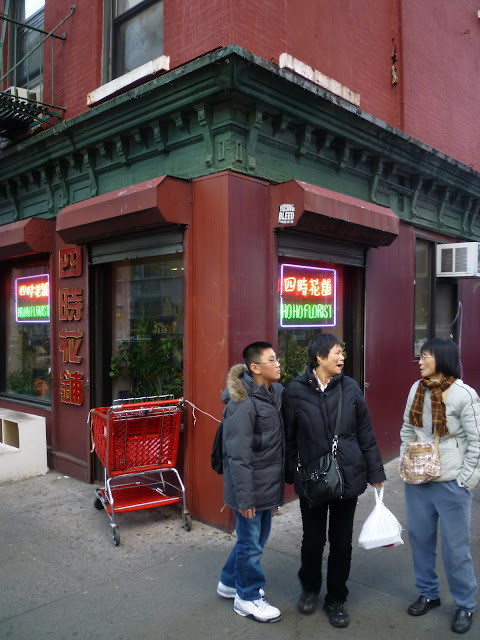 Wallach's parents operated a candy store in the ground floor of that building. Also, they were the only Jewish family on the block; the neighborhood was then, as now, heavily Italian. The shop is now occupied by Love Thy Pet, a locally beloved pet supplies store. You step down a few stairs to enter the store. The layout is very much in keeping with what might well service a candy shop. I don't want to live in a New York where steam doesn't belch out of the street. 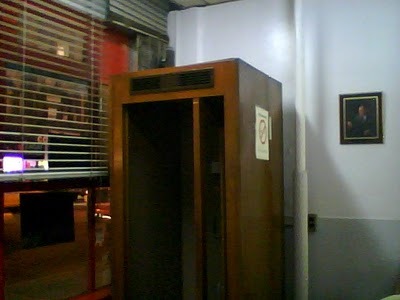 I've taken a fair amount of time over the years to rhapsodize about New York's dying wooden phone booth population. They're not so common anymore, but neither were they hard to find, if you knew which old bars and libraries to go into. But recently, there's been a great falling off, mainly because so many old joints have bit the bust. 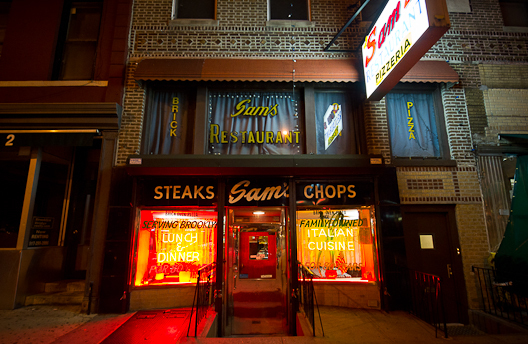 The booths in Chumley's, Gino's (above), Fedora, Von Westernhagen's—all gone, because those restaurants are gone. And many of the remaining booths are being gutted, their phones removed, leaving wooden shells that have only a decorative use. Sardi's lost it's phones. The booth at Capsouto Freres doesn't work anymore. Neither does the one at Bill's Gay Nineties tavern. This is, I expect, because the wicked phone company charges businesses extra for keeping wooden phone booths in working order. I could have bought the booth at Von Westernhagen's, but I couldn't afford it and had no vehicle with which to pick it up. Kills me to think I let it go. When I first moved to the "wrong" side of the BQE in Carroll Gardens, the Waterfront Family Restaurant was one of the few going businesses along Columbia Street. But it closed soon after I moved nearby, and has sat stuck in time ever since. Last week I saw the door open, the lights on and someone rumbling inside for the first time in a decade. No idea what's going on in there. But it was rather interesting to see how little the diner has changed since it entered its cocoon state. 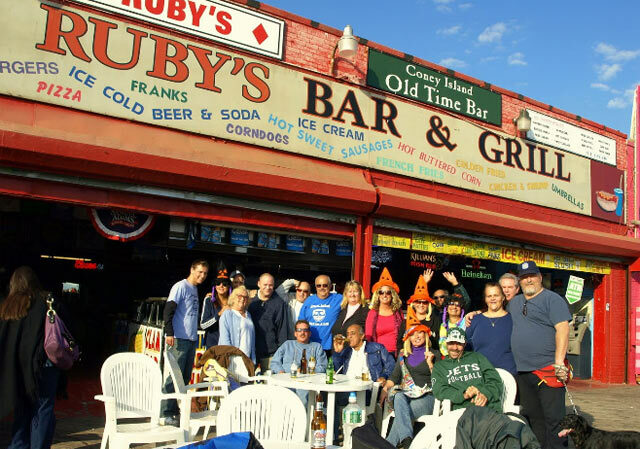 Ruby's Bar & Grill, a raffish, Coney Island treasure to those who knew how to treasure Coney Island, has closed for good. The landlord did not renew the lease. I was one of millions who have had a beer or two at the old bar at some point during the 76 years it was open. Those of you who are now reading this, and are just hearing of Ruby's, will never have the pleasure. 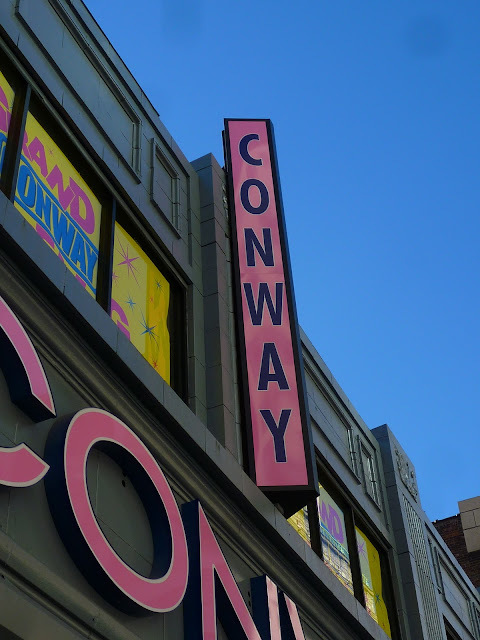 No neighborhood in New York has been so shabbily treated by the City over the past decade as Coney Island. In an area already populated with obscene "stores" dedicated to merchandising the most horrifying junk food known to man, the Pop-Tarts Cafe (only just noticed by this person) represents a new low. I thought there was no place one Earth where I could feel more nauseated than I do at the M&M store. I was wrong. The people employed in this cafe seem awfully embarrassed. I suspect they know they are participants in a terribly disgusting enterprise. I can sort of imagine the kind of person who buys an M&M t-shirt, or a Hershey's hat. But who in their right mind wants the wear Pop-Tarts apparel? There's a cafe with a menu that out to be against the law, such a nuisance to public health it is. Pop-Tart kebob? Pop-Tart pizza? They're all just excuses to eat more than one Pop-Tart at a time. 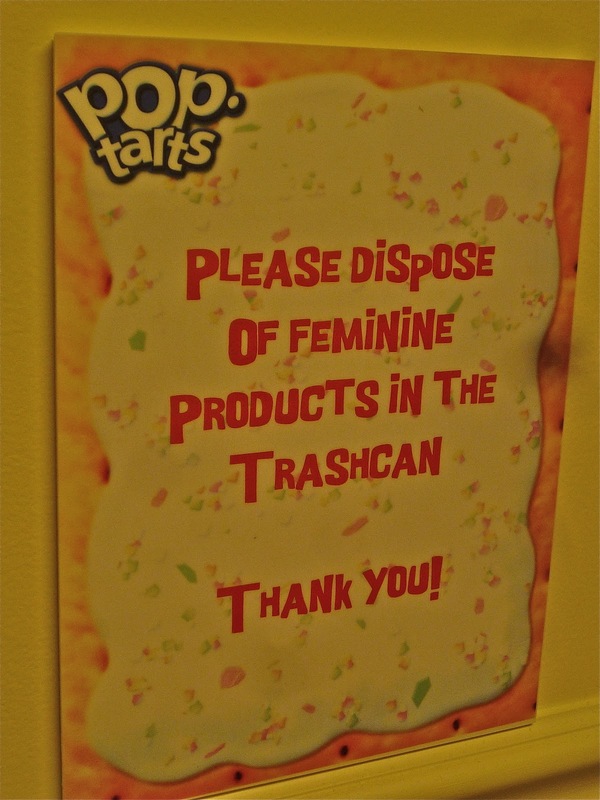 But, if you've always wanted to see bathroom instructions on the proper disposal of sanitary napkins printed on the image of a Pop-Tart, well, look no further.